Watch our tour of the South Florida Museum near Tampa Bay, Florida shot with the Sony WX50 Cybershot camera. If you’d like to create your own free video slideshow with your own photos click here. As I stepped into the South Florida Museum with my three year old daughter we were immediately confronted with a giant skeleton. The skeleton was of a giant tiger that once called Florida home over 10,000 years ago during the last Ice Age. Beyond this skeleton was another room with an even larger skeleton. This skeleton was of one of the giant elephants called mastodons that shared the Florida landscape with the giant tiger. A replica of one of the leg bones of this elephant stood in front of the exhibit. 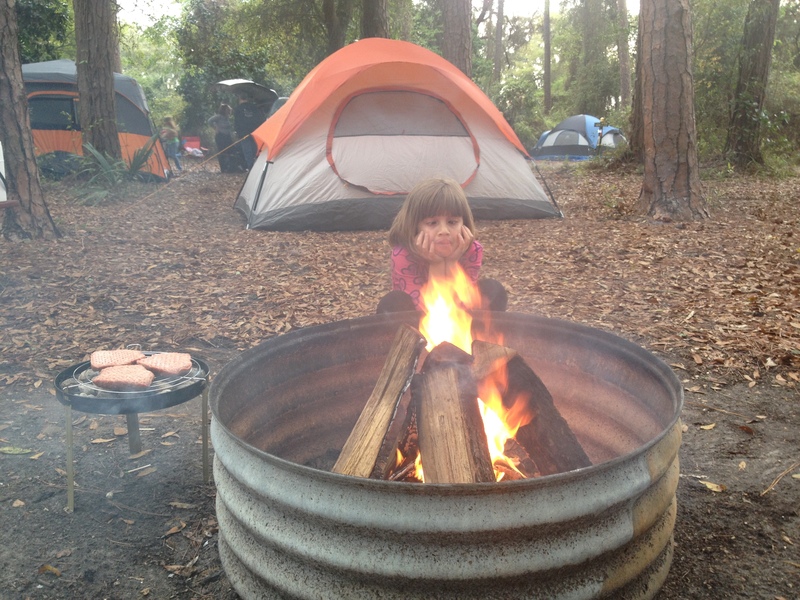 My daughter eagerly stood beside it to see how she compared. The bone was as tall as she was. My daughter was initially excited as we settled into our reclining seats with a perfect view of the domed screen above and around us. The show we were there to see was called “Extreme Planets.” Although quite educational for adults or older children, the film did not exactly hold the attention of my three year old and she soon wanted to leave. As we exited the planetarium we passed a room called The Discovery Place. We entered and found a room full of hands on exhibits especially for kids. 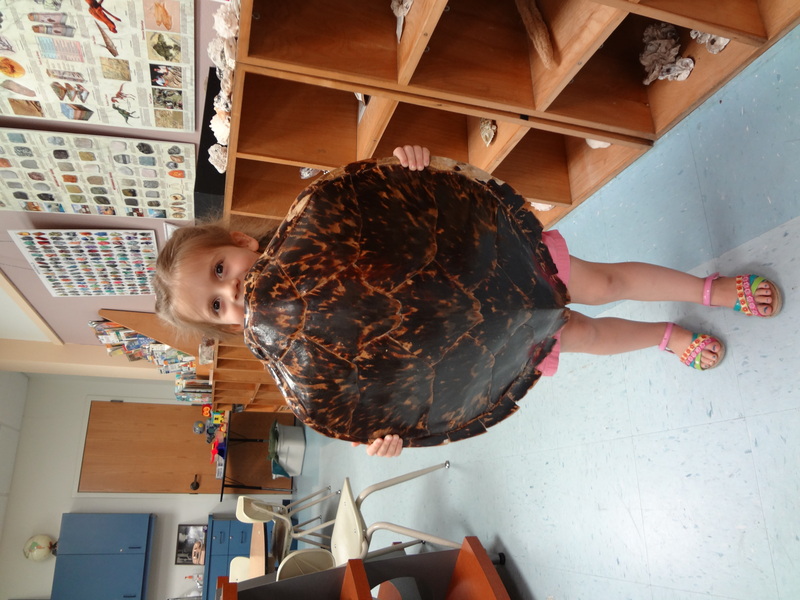 The room was filled with turtle shells and sea creatures and more. 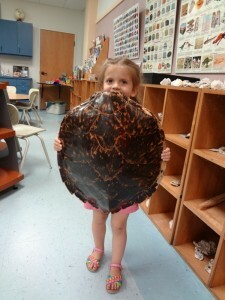 My daughter was excited that she could touch and hold everything in the room. I think I had as much fun (if not more) watching her exploring the items in the room as I would have had watching the planetarium movie. 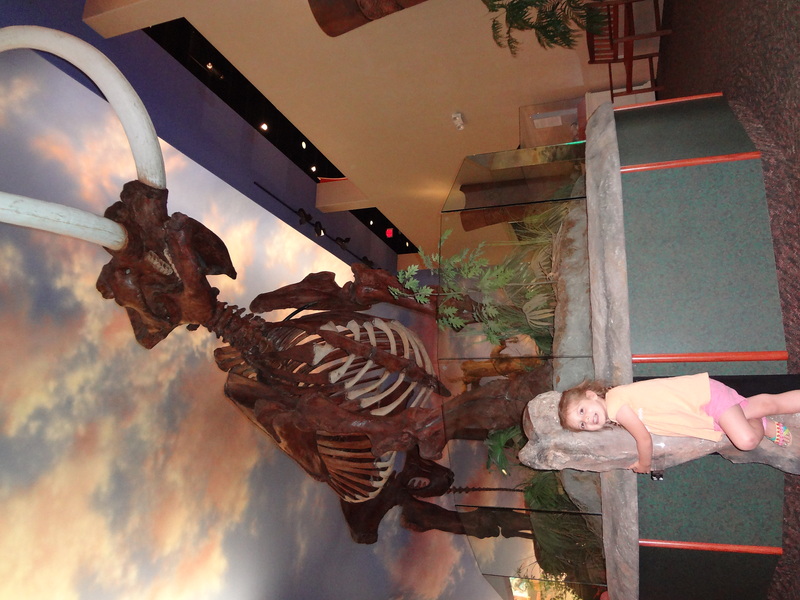 We soon left the Discovery Place and returned to the Great Hall where the mastodon skeleton was on display. From here we passed a recreation of a paleoindian bison hunt on our way to the exhibit entitled Florida Land of Change. 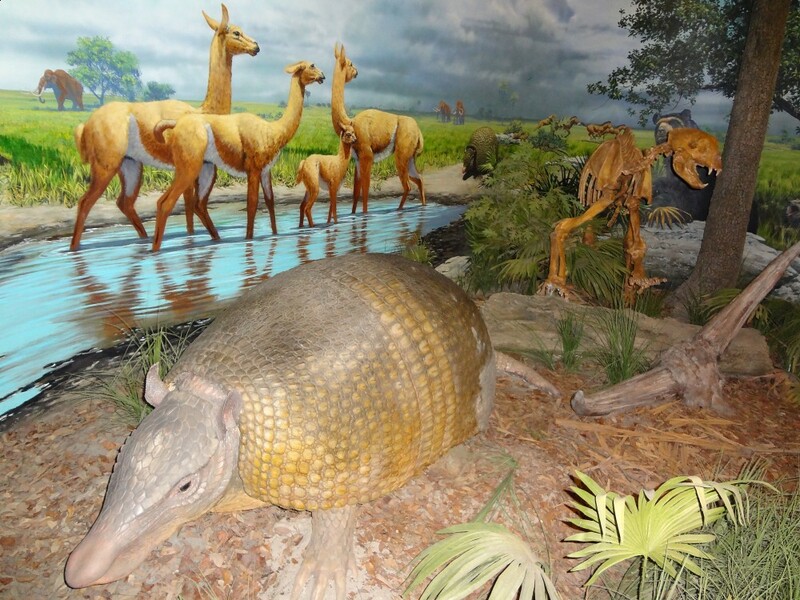 This exhibit explained why no dinosaurs ever lived in Florida: it was underwater. The exhibit did showcase the giant monsters that once inhabited these waters. Visitors are greeted by the huge jaws of a giant shark that could have easily swallowed a school bus. 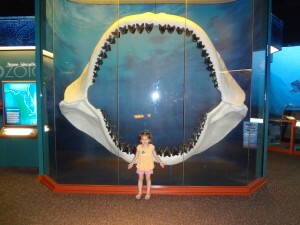 My daughter was excited to stand in front of these jaws for a photo op! From here we moved on to the exhibit entitled Fabulous Florida Fossils. As the name implies, this exhibition space was filled with skeletons of the exotic animals that once lived in Florida during the last Ice Age. The variety of animals was amazing from giant armadillos the size of a small car to horses, camels, and predators such as saber-toothed tigers. 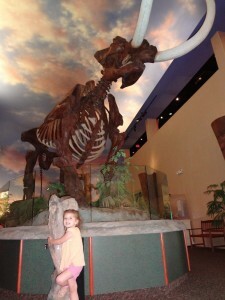 My daughter was thrilled by these skeletons and recreations of giant animals. Next we entered the Archaic Peoples exhibit. This exhibit showcased the people who lived after the end of the last Ice Age when all these large animals had become extinct. The exhibit doesn’t answer the question of what happened to cause all these animals to disappear. Clearly something catastrophic happened 10,000 years ago that melted the glaciers and wiped out countless species of animals in North America. The survivors were the people we call Native Americans today. This exhibit showcased their tools and way of life as they adapted to this new environment. From here we entered the Tallant Gallery. 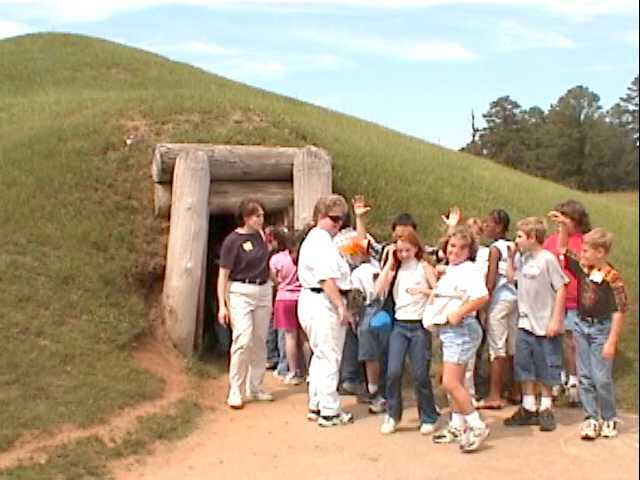 This exhibit featured the artifacts of the ancient Native American civilizations of Florida. The exhibit featured a collection of exquisite pottery and gold artifacts unearthed at various archaeological sites around Florida such as the Ortona Mounds site. The exhibit also featured a diorama depicting the life of the Tocobago Indians who lived in the area over 500 years ago. 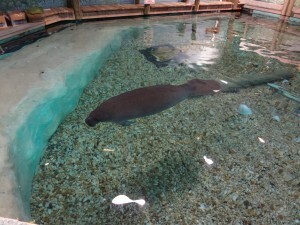 It was nearing 1:00pm now so we hurried to the Parker Manatee Aquarium for the feeding of the manatees. 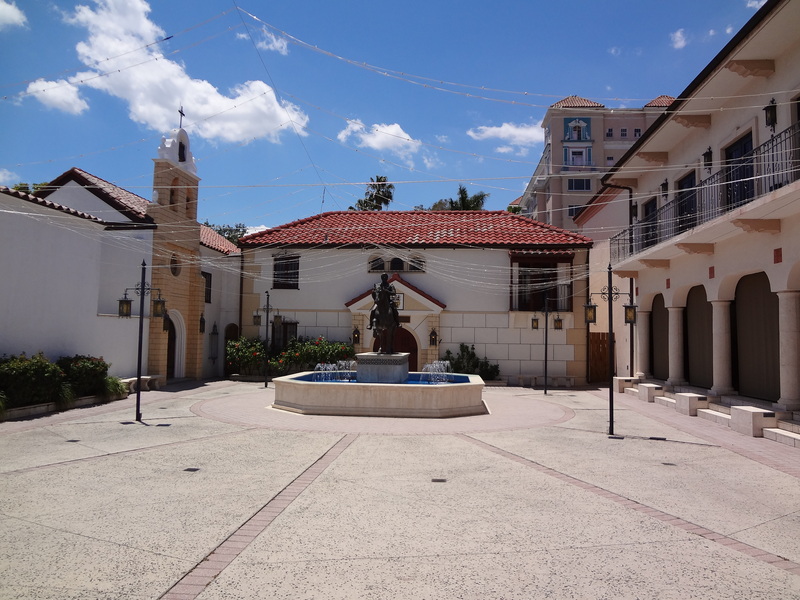 As we exited the museum we entered the Spanish Plaza that housed a statue of conquistador Hernando de Soto who explored Florida and the southeastern U.S. in the 1530s. The plaza has a recreation of de Soto’s boyhood home in Spain as well as a small chapel. Across from the plaza is the aquarium. 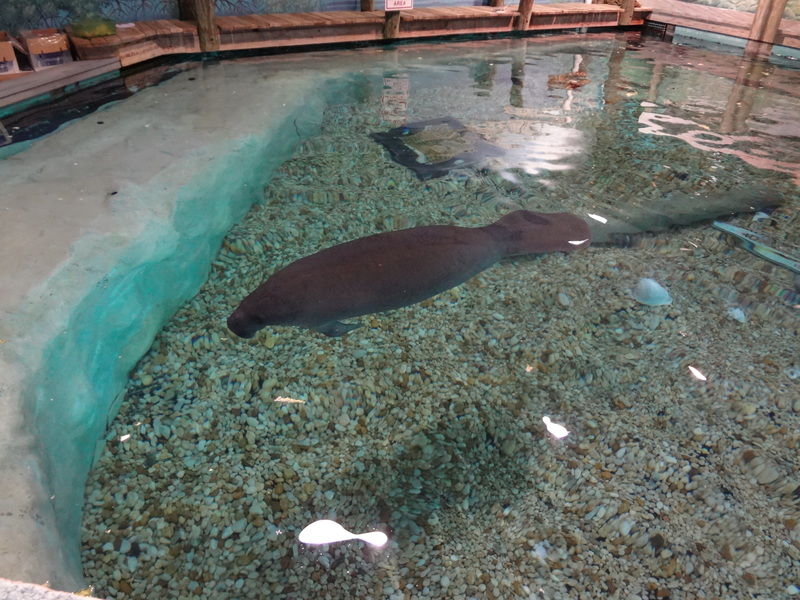 The aquarium is home to Snooty, the oldest known manatee who was born in 1948 in Miami. There was a large viewing window to see the manatees who were swimming around. We also noticed stairs that led to another viewing area where you could look down into the tank from above. It is here where the presentations are given and the feeding takes place. Apparently the show had started a little early due to a large school group that was in the room and the manatees had already been fed. But one of the manatees was still eating what looked like lettuce. My daughter was absolutely thrilled by this and became even more excited when two more manatees returned to the main tank and swam around. 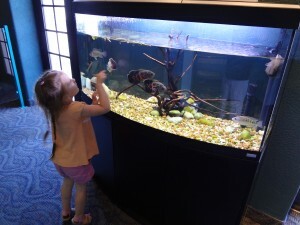 The aquarium also housed small saltwater aquariums with a variety of fish. One tank looked like a recreation of the movie Finding Nemo with both a clown fish and sea anemone. From here we entered the Gulf Waters exhibit which gave the impression of an underwater view of fish and other creatures living in the waters of the Gulf of Mexico. This led to the Riverine Gallery where visitors learned about mangrove islands, estuaries and the local Manatee River. From here visitors were led through the Pine Uplands exhibit which included a pioneer cabin from 1880s. 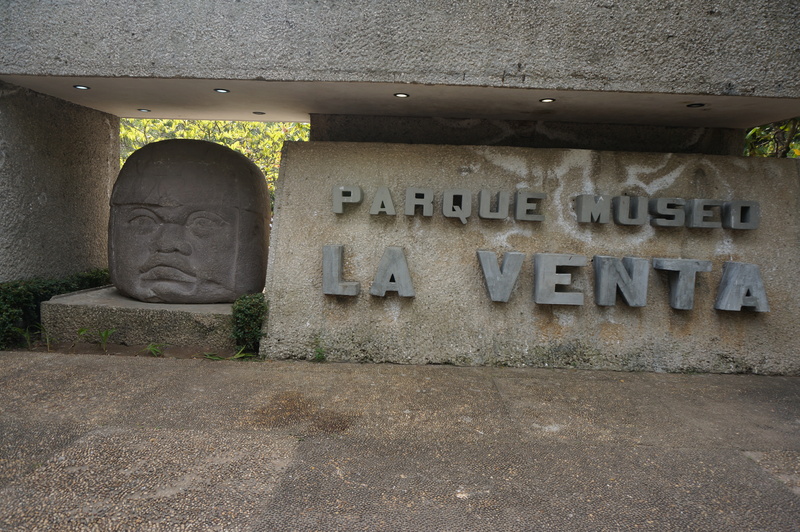 Other exhibits on this floor included a Medical Gallery, Shell Collection and River Heritage Hall that included artifacts from the time of European contact until the 20th century. Overall our visit to the South Florida Museum was enjoyable by both myself and my little one. I loved the Native American exhibits and artifacts and she loved the manatees and hands-on exhibits. Before leaving we stopped by the gift shop and picked up a small manatee stuffed animal so she could always remember her visit to the South Florida Museum.